Trialtech | Updates: Thomas Oehler - Now With Added Titanium! You are here: Home » Updates » Thomas Oehler - Now With Added Titanium! Thomas Oehler - Now With Added Titanium! As you may have seen in the previous News Update (here), team rider Thomas Oehler from Austria had an unlucky fall while riding and unfortunately broke a bone in his ankle. Well, the latest update is that Thomas visited the hospital for a check-up on the progress of his ankle and they decided it would be best if the piece of broken bone was screwed back in to place to be sure it heals in the right way. 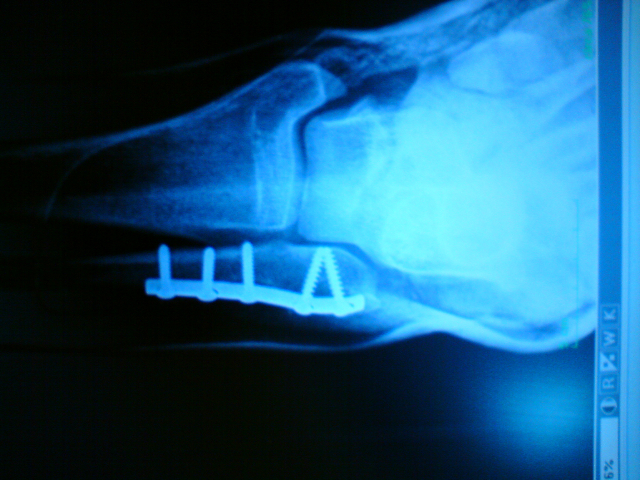 As you can see from the x-rays, they managed to fit in 5 Titanium screws and a small plate. For those of you who like your photos a little more 'real', here is a photo straight after the operation showing the scar and the tube that allowed fluid to escape from the ankle and relieve painful pressure caused by swelling. Apparently Thomas thought it was "quite funny" when they pulled the tube out of his leg, personally I wouldn't find someone pulling a plastic tube out of my ankle that amusing! Thomas will now be in a cast for 4-6 weeks, but with the operation completed the chances of a full recovery in the shortest possible time are good. The latest word from Thomas is that he has taken one step backwards, but he will back better and stronger for the rest of 2009! Good luck with the recovery dude!